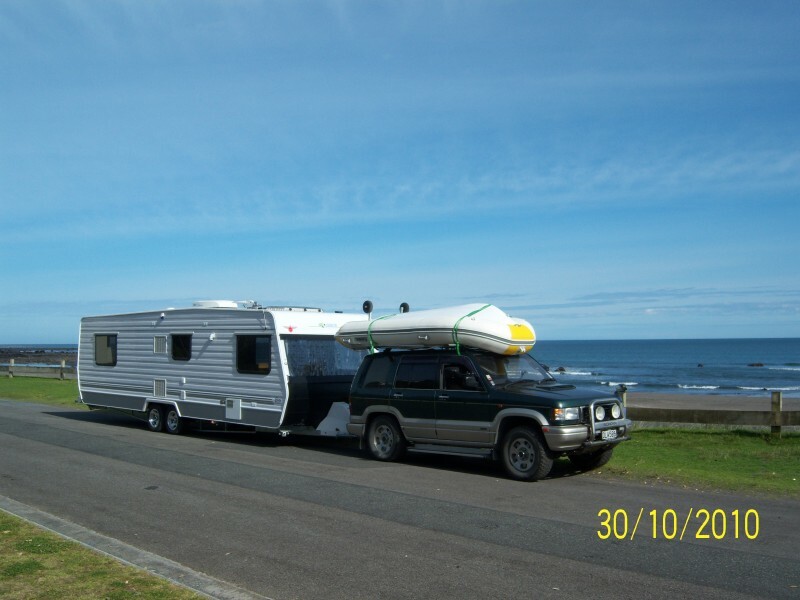 "Steve & Lana's Caravan" is owned by Steve & Lana from New Zealand. 8.0 metre Leisureline Elite Caravan. Island bed at rear, toilet shower u shaped lounge at front. 2 Unisolar 68watt solar panels Sunsolar 10amp controller two 6volt 225amp hr batteries. Honda 2kva generator All lights 12v LED. After dreaming about going on a working holiday around NZ or Australia and working out whether we would go caravan or motorhome the opportunity suddenly arose & we decided to go for it. We left April 2010 doing seasonal work in the north island then crossed in to the south island Nov 2010. We travelled right to the bottom & back up to the top doing seasonal work again and are still here doing work in Motueka at the top of the south island. We love the lifestle & dont want to go back into a house again anytime soon. We also took our cat Bootz & she loves it.